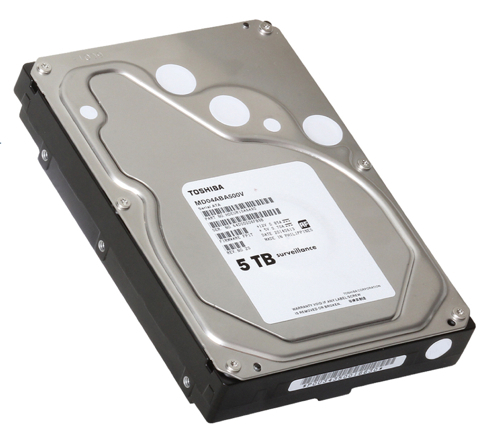 Toshiba has wrung another market slot-filling product out of its 5TB disk tech – a surveillance drive. The company has two existing 5TB disk drive products. There is the MC04ACAnnnE bulk storage drive spinning at 7,200rpm for servers and arrays with cloud-scale needs. It has a 6Gbit/s SATA interface and an 800,000 hours MTBF rating. Secondly, there is the MG04 with 6Gbit/s SAS or SATA interface with a faster throughput. The drive is classed by Toshiba as a “surveillance drive” as it's aimed at video surveillance storage needs, where a set of disk drives is used to record video images and/or data streams from CCTV cameras. The incoming data pattern is pretty uniform with known amounts and delivery rates, and data access needs are relatively rare. Details of the third 5TB product, the new MD04ABA-V Series drive, are straightforward enough: we understand it’s a3.5-inch form factor offering 4 and 5TB capacities from its 5 x 1TB platters. It has a 128MiB cache, a 1 million hours MTBF rating, and rotational vibration damping to make it suitable for RAID enclosures. The thing supports incoming data streams from up to 32 high-definition cameras and is for 24 x 7 operation. Toshiba is being quite coy about the spin-speed, saying it is "low". We think that might mean 5,700 - 5,900rpm and cannot understand why Toshiba won’t publicly release such basic information.